Outdoor activities for kids | Kids outdoor paintball parties at RW Paintball. RW Paintball offers outdoor activities for kids. 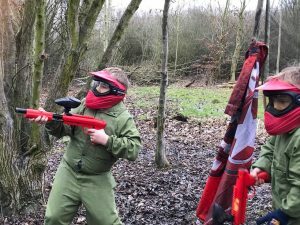 Childrens Paintball parties and Laser Tag are available at our range of woodland sites across the home counties. Close to Basildon, Broxbourne, Canterbury, Cheshunt, Bishops Stortford, Dorking, Harlow, Longfield, London, Sidcup and Southend we have locations offering outdoor activities for kids. Paintball has been long established in the UK. However, looking for similar outdoor activities for kids has always been hard work. AT RW Paintball we introduced kids paintball parties a few years ago. Aimed at 8-11 year olds, childrens paintball is ideal for groups of 10+ children. It’s a high adrenaline outdoor activity that gives them the experience and thrill of Paintball with added safety. We use low impact, pump action, weapons and play the games in a safely controlled environment. Played in the same zones as our adult Paintball games, this gives the children a real feel of excitement. The feedback we receive is amazing! 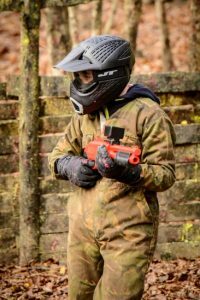 If you’re thinking about a kids paintball party you can click here for more information: Childrens Paintball. For groups of 10 -15 players some of our sites offer laser tag parties. Perfect for younger players who want to play our action games without the pain. No impact, just lasers, our equipment lights up and buzzes when a player has been hit. This allows younger children to enjoy their day without being hit by any paintballs. You can click here to find more information on Childrens Laser Tag parties.